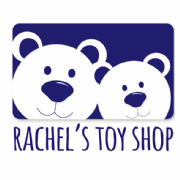 Rachel's Toy Shop was founded in 2013 to try and provide language toys for parents who wanted their children to be multilingual, but it has grown considerably since then! The business operated largely online until Spring 2017, when it opened its first "proper" shop. After finding beautiful toys at trade fairs that you just couldn't get locally, founder Rachel Fairhurst had a dream to open a shop. As a mother of two, her dread at having to visit the local out of town stores to find party gifts or birthday presents for her own children and nephews led her to start to look for somewhere locally where she could open an independent toy shop. She realised she couldn't do it alone - she had never given up the day job - so she joined forces with her friend Rosie Pilling, a former teacher and creative genius! Rosie has come in and organised Rachel (something she has unsuccessfully resisted!) and brought fresh ideas. With an excellent eye for the educational possibilities of the toys, Rosie has helped Rachel to realise her dream and they hope to welcome you soon at the Wigan Lane shop.